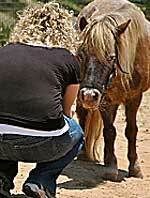 In our unicorns seminars we strive to find and emphasize the strengths of both horses and humans that we work with. We focus on helping people broaden their abilities to express themselves, communicate and reach others in new and effective ways, highlighting awareness to true self and awareness to the vast variability and uniqueness of others. We see our horses as equal partners; we cherish each one of them for their unique personalities and teaching styles. They keep on amazing with their uncanny ability to present to each and everyone with the right mirror at the right situation, giving the right lesson at the right time. And for that we thank them. We, as human facilitators, bring on with us human behavioural and psychological education, as well as creative and artistic education, combined with many years of experience as equine assisted therapists. Our participants come from the professional field as well as the social field. We work hand in hand with the professional education system. Our wish is to contribute to the community in which we live in by helping people meet themselves and others in an open minded and an authentic way.